Our services are competently monitored by our torchbearers with insight and value to the customers by inducing customer service, regional knowledge, sound expertise and global connection. 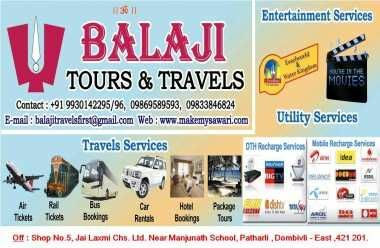 The philosophy of Balaji Travels is to persistently strive for excellence in Travel and Tour services and customer relationship to become ‘the company of client’s choice’. We are specialized in Handling Leisure Tourists, Corporate Clients, Students for individual and group guests and conduct Domestic and International Tours. We have customized Inbound Tour Packages. We arrange special tour packages such as Wild life exploration (Safari, Trekking, Adventure trips), Religious trips to holy destinations, Traditional / Heritage sites, Study and Observation tours to various destinations in North East India covering Arunachal Pradesh, Assam, Manipur, Meghalaya, Mizoram, Nagaland and Tripura. We have associations with leading International Service providers and conduct Standard as well as Luxury International Packages. We provide AC/Non Ac Indica, Tata Sumo, Tata Indigo, Bolero, Travera, Innova, Tata Safari, Scorpio, Accent, Ford Ikon .These services are provided across India. We provide assistance across wide range of Events and related services. The prime events that we cover are Business events, Corporate events, Cause related events, Exhibitions, Government events, Entertainment events, Concerts/ live performance, Government events, Meetings, Seminers, Workshop & Conference. As part of our activities, we offer Domestic and International Air ticketing services and railway ticket assistance. Your bookings are confirmed instantly and tickets delivered at your doorstep or your mail box!